A Tankless Water Heater in Apache Junction, AZ can raise tap water to a digitally set temperature when a hot water faucet is opened and the tap water passes through either a gas burner or an electric element and a heat exchanger. Tankless water heaters do not store hot water. When a homeowner wants hot water and turns the hot water faucet on, the water runs through the heater and a flow sensor fires a burner. The heat exchanger is surrounded by water lines which warm to the desired temperature. When the faucet is turned off the flow sensor turns off the burner. Due to gas powered Tankless Water Heaters in Apache Junction, AZ being much more common than electric powered tankless water heaters, most of this information is geared toward the gas powered heaters. It has been discovered that the electric tankless water heaters cannot deliver hot water fast enough if the groundwater is cold and where it is not cold, most homeowners would require major upgrades in their electric service to power a tankless heater large enough for a whole house. It is important to note that during power outages hot water is unavailable. However gas powered water heaters do need electric outlets for their fan and electronics, upgraded gas pipes, and ventilation systems. Tankless Water Heaters in Apache Junction, AZ require annual servicing and where water is hard, it is recommended a water softener is installed. Calcium or hard water “scale” can build up in tankless hot water heaters. This buildup may also decrease efficiency and restrict water flow. 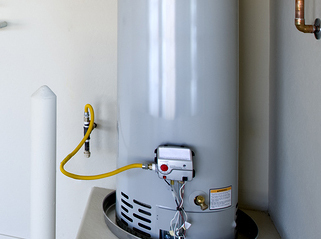 The installation of a tankless water heater costs more upfront due to possible upgrades needed in a homeowners plumbing, electric, gas pipes, and ventilation systems. Some homeowners may find they need to upgrade other items to support a tankless heater such as the water softener mention earlier. Tankless hot water heaters do not promise all the hot water one wants all the time, yet they are believed to save money in their long term use.